Dark Chocolate Sponge Candy - 13 oz. 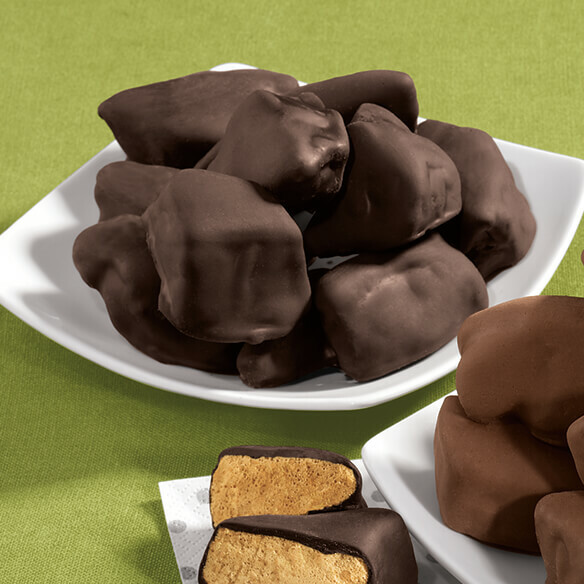 This beloved, old-world confection goes by many names ... sponge candy, angel food, seafoam, honeycomb and molasses puffs. With magical, caramelized sugar center that’s crisp at first, then melts marvelously in your mouth, this luxurious treat is drenched in creamy milk or decadent dark chocolate. One bite, and you’ll be hooked! 13 oz. each. Dark Chocolate: Dark Chocolate Flavored Coating (Sugar, Partially Hydrogenated Palm Kernel Oil, Cocoa Powder [Processed With Alkali], Soy Lecithin [An Emulsifier], Artifical Flavor [Vanillin]), Sugar, Corn Syrup, Sodium Bicarbonate, Molasses And Salt. Allergy Information: Manufactured on shared equipment with peanut and other tree nut products. Incidental nuts may be present. Dark Chocolate: Serving Size 2 pieces (40g). Amount Per serving: Calories 180, Calories from Fat 60, Total Fat 7g, 11%; Saturated fat 5g, 25%; Trans Fat 0g; Cholesterol 0mg, 0%; Sodium 90mg, 4%; Total Carbohydrates 31g, 10%; Dietary Fiber 0g, 0%; Sugars 11g, Protein 1g; Vitamin A 0%, Vitamin C 0%; Calcium 3%; Iron 0%. These Sponge candies were a wonderful reminder of my childhood in Wisconsin. We grew up with candies just like these, but we called them honeycomb chocolates. They just melt in your mouth. I am so happy that they come in dark chocolate, since I am no longer allowed to have milk chocolate. This is my annual Christmas treat. Just what I remember eating as a child. Only thing the color of chocolate wasn't as dark as shown on photo. Great crunch and taste. It was a trial run but the recipient loved it! Big hit. She asked me to hide the rest so the entire bag wasn't consumed the same night as it arrived. This is an old time candy that has come back and is better than ever. It is in a plastic bag & doesn't look very appealing BUT it's absolutely delicious!! We bought the dark chocolate was loved by all. I have loved this candy for MANY YEARS! Back in MY day, we called it Seafoam, though. I get it every so often as a treat . milk chocolate sponge candy, is delicious. It had been years since I sampled this mouth watering favorite. I'm so glad that I can order them both here at Miles Kimball. Ate the whole bag in just a few days, too good to last long. Large pieces that satisfy your sweet tooth. I thought that I would get stale candy, BUT I DIDN'T. I would buy this over and over again. Very good. Melts in your mouth. Once a year I treat myself to two of this Dark Chocolate Sponge Candy.. I am 90 years old I call this my energe food. This was really good although it looked like milk chocolate, not the dark which I ordered. Going to try again and hope its dark. Just wish it was in smaller pieces. I usually buy 5 packages every Christmas for all my niece's and nephew's families. I always buy one for myself on my birthday. Reminds me of my childhood when when would get Angel Candy as a special Christmas treat. Glad to have a place to order it from. Will definitely order it again. Not beautiful but delicious and a crowd pleaser. Packaging was lacking. The product arrived looking messy. I've had a similar product that arrived in neat squares protecting the chocolate from rubbing and looking messy. Also, an order for a initialized Christmas Ornament arrived mis-spelled. I ordered, on the sheet, Salon 2000, I got Saloon 2000. It arrived days before the holiday so I still presented it to my stylist. She got a laugh out it, but to have something so cute intending to be special, it was disappointing. So disappointed!!!! REALLY wanted to give 5 stars! I bought this for Christmas, it was back ordered but SO worth the wait. So then i ordered 3 more for valentines day, 1 was milk choc. that I wanted to try. They were awesome [personally dark is better, but others loved the milk]. Then, with Easter in mind, I ordered 12 packs, over $100 worth of candy, and just recieved them....I am so disappointed!!!! The others I recieved were big, chunks with a little bit of smaller pieces. This order I recieved was NOT the same. 9 out of 12 bags were mostly small pieces with a couple big chunks per bag. Which would be fine if it weren't mostly choc... I wanted the sponge, not all this choc. Giving 4 stars because it IS the best sponge, with a hint of salt at the end, just wish i would of gotten what i was paying for! There is to much sweet chocolate so you could not taste the inside the way you should. I would have preferred a little less sweetness in the dark chocolate also. Original order came in a box in good condition. The next order of two packages ?? came in an envelope and the candy was crumbled. Love the seafoam candy but this brand is a little too sweet for my taste. It also crumbles really easy so is falling all over your lap. Will still recommend as it is a great sweet treat for someone who likes it that way. It really isn't the product as much as how the chocolate candy was shipped--no ice packs or anything so therefore when we received (here in AZ ) all was melted in the bag they would sent in!! We were highly disappointed--have put the bags in the refrigerator, and hope we can sample them even though all are stuck together! Maybe you could do a little better protecting items like these when it comes to shipping them! Not what I'd call REAL sponge candy. Not what I expected. The coating is "chocolate flavored coating". I expected real dark chocolate. Taste is not bad, but not like "the real thing"
Sadly, like all the good things of the past...they are "in the past", just a memory. The candy lacks real chocolate flavor No doubt because of lack of cacao. The molasses sponge didn't melt on the tongue the way it used to in the original candies. The pieces were too large and hard. Not at all like the candy I used to get years ago. HUMMMMM. please package better this time last time the bags exploded every where in the box. My mother is a huge fan and the candy pictured looks delicious. Love this kind of candy. Want to see how it compares to this type of candy I have purchased in past from other venders. Again, takes me back in time. I ordered this item because I love dark chocolate candy. Also, the description made me wish I had dark chocolate candy.